1. Eye : Acute exposure of the eye to lasers of certain wavelengths and power can cause corneal or retinal burns (or both). Chronic exposure to excessive levels may cause corneal or lenticular opacities (cataracts) or retinal injury. 2. Skin : Acute exposure to high levels of optical radiation may cause skin burns; while cancer may occur for ultraviolet wavelengths (290-320 nm). 3. Chemical : Some lasers require hazardous or toxic substances to operate (i.e., chemical dye, Excimer lasers). 4. Electrical : Most lasers utilize high voltages that can be lethal. 5. Fire : The solvents used in dye lasers are flammable. High voltage pulse or flash lamps may cause ignition. Flammable materials may be ignited by direct beams or specular reflections from high power continuous wave (CW) infrared lasers. * What are the effects of laser energy on the eye? * Laser light in the visible to near infrared spectrum (i.e., 400 - 1400 nm) can cause damage to the retina resulting in scotoma (blind spot in the fovea). This wave band is also know as the "retinal hazard region". * Laser light in the ultraviolet (290 - 400 nm) or far infrared (1400 - 10,600 nm) spectrum can cause damage to the cornea and/or to the lens. * retinal damage may be associated with an audible "pop" at the time of exposure. Visual disorientation due to retinal damage may not be apparent to the operator until considerable thermal damage has occurred. * Exposure of the skin to high power laser beams (1 or more watts) can cause burns. At the under five watt level, the heat from the laser beam will cause a flinch reaction before any serious damage occurs. The sensation is similar to touching any hot object, you tend to pull your hand away or drop it before any major damage occurs. * With higher power lasers, a burn can occur even though the flinch reaction may rapidly pull the affected skin out of the beam. These burns can be quite painful as the affected skin can be cooked, and forms a hard lesion that takes considerable time to heal. * Ultraviolet laser wavelengths may also lead to skin cancer. Lasers operate in the ultraviolet, visible, and infrared. High power lasers can cause skin burns. •	Class 1 describes lasers that do not, under normal operating conditions, pose a hazard. • Class 2 indicate low-power visible lasers which, because of the normal human aversion response (i.e., blinking, eye movement, etc. ), do not normally present a hazard, but may possibly present some potential for hazard if viewed directly for extended periods of time (like many conventional light sources). •	Class 3a indicates lasers having a CAUTION label that normally would not injure the eye if viewed for only momentary periods with the unaided eye, but may present a greater hazard if viewed using collecting optics. 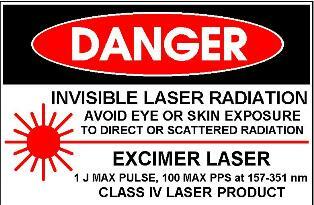 Class 3a lasers have DANGER labels and are capable of exceeding permissible exposure levels. If operated with care, Class 3a lasers pose a low risk of injury. •	Class 3b denotes lasers that can produce a hazard it viewed directly. This includes intrabeam viewing of specular reflections. Normally, Class 3b lasers will not produce a hazardous diffuse reflection. 1. Laser Protective eyewear is to be available and worn in by all personnel within the Nominal Hazard Zone (NHZ) of Class 3 b and Class 4 lasers where the exposures above the Maximum Permissible Exposure (MPE) can occur. 2. The attenuation factor (optical density) of the laser protective eyewear at each laser wavelength should be specified by the Laser Safety Officer (LSO). 3. All laser protective eyewear shall be clearly labeled with the optical density and the wavelength for which protection is afforded. This is especially important in areas where multiple lasers are housed. 4. Laser protective eyewear shall be inspected for damage prior to use. Lasers are rapidly finding applications for industrial processing including welding, cutting, drilling, marking, hardening, texturing,trimming, soldering, and rapid one-off prototyping. 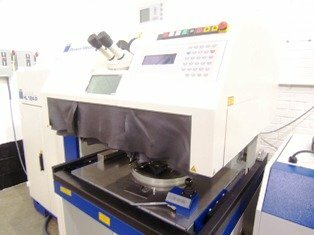 Over the last twenty years, a large variety of laser technologies have been improved to the point where engineers are faced with a lot of choices.Laser welding is being used today for repair of injection molds, tool and die repair, aerospace repair welding, and restoration of exotic metals like A286, Waspaloy, titanium, Haynes 188, Rene 77, and a bunch of other metals. One of the keys to hardness is rapid cooling. Pulsing allows rapid cooling by having 5% to 10% beam on time and 90% to 95% beam off time or cooling time . This way The last pulse has solidified before the next pulse happens. Laser weld metal deposits on tool steel can be very hard and often possess adequate hardness without heat treatment. The welds can also be smoothed with a de-focused beam to where minimal finishing is required. 1. Laser energy: Peak laser energy is measured in watt/seconds or joules. Average laser energy is measured in watts. 2. Frequency: The repetition rate of the laser pulses, expressed in Hz. 3. Focus: The laser energy can be focused into a tightly compressed spot only a few thousandths of and inch in diameter or can be opened to micro-arc energy density diameters.